A month ago you went through the process of tile selection with your customer. Today, you order your field tile but the bullnose tile trim is back-ordered. The solution is American Bullnose Company. From your field tile we produce matching bullnose tile trim for any tile, usually in four to seven days. 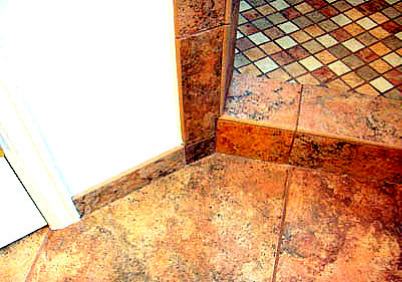 In addition to regular surface bullnose tile American Bullnose Company manufactures bullnose on opposite sides for shower curbs, eliminating the middle grout joint. We also offer bullnose tile made to your size specifications for benches, shampoo insets, shampoo shelves, back splashes and full-sized bullnose made from full-sized tile. Stair tread tile and modular tile sizing are other solutions available to you to help make your customer’s tile installation truly unique and functional. Click on the location links to find your closest American Bullnose Company.